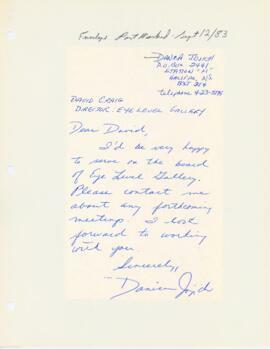 Item consists of a letter from Daniel Jojich to David Craig, the Director or Eye Level Gallery, stating his acceptance to serve on the board of the gallery. 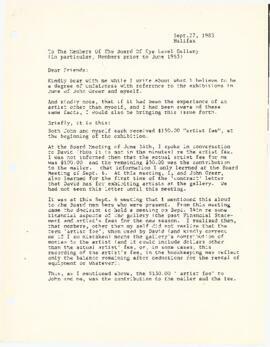 Item consists of a letter from John Murchie to David Craig writing about ANNPAC, the Eye Level Gallery and upcoming events. 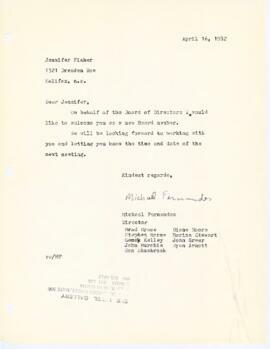 Item consists of a letter to Jennifer Fisher from Michael Fernandes welcoming her to the Board of Directors at Eye Level Gallery. 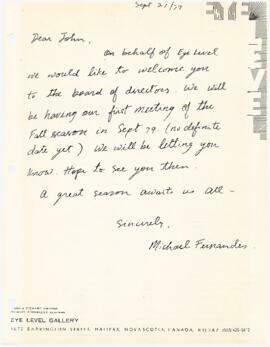 Item consists of correspondence sent to John from Michael Fernandes welcoming John to the Board of Directors at Eye Level Gallery. 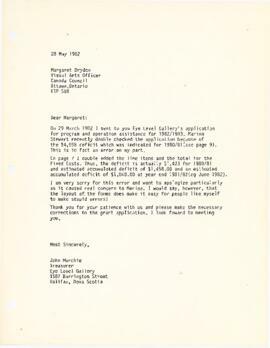 Item consists of a letter from John Murchie to Michael Fernandes and David Craig regarding a financial donation to the gallery from the 1983/1984 exhibition programming. 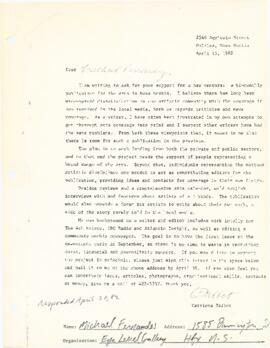 Item consists of a letter to Michael Fernandes to Catriona Talbot regarding support and funding for the local art community. 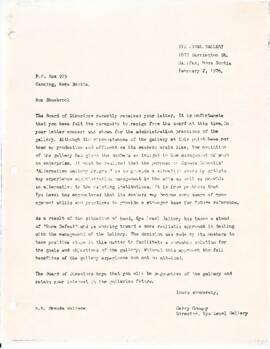 Item consists of a letter to the Board of Directors of Eye Level Gallery from Rose Adams regarding an issue with the installation of paintings at the gallery. 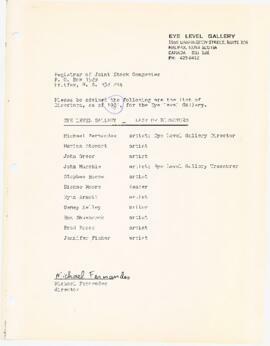 Item is a list of the Eye Level Gallery's members which was sent to the Registrar of Joint Stock Companies from Michael Fernandes. 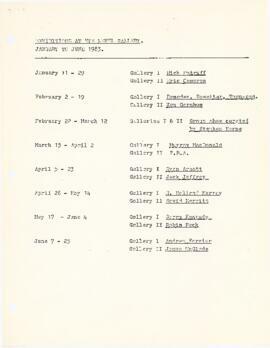 Item consists of a list of the 1982 Board of Directors at Eye Level Gallery, which includes Board Member's names, residential/employment address and occupation. 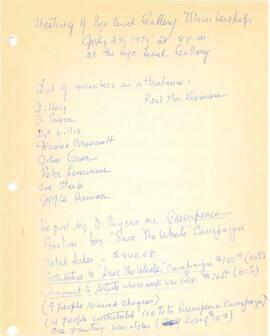 Item consists of a list of the Board of Directors at Eye Level Gallery. 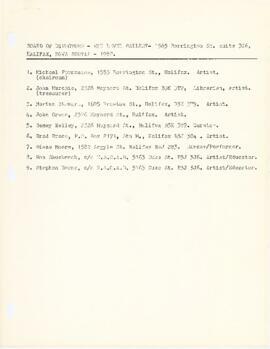 The list includes the names of the members, address of residence or employment and occupation. 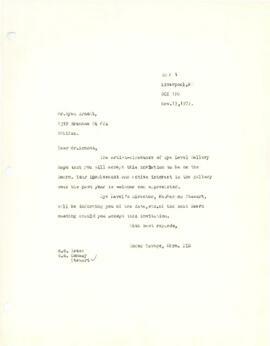 The Concerns for Seafarers Witness Society. 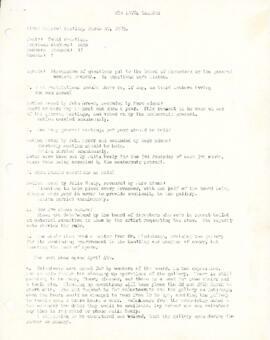 File contains meeting minutes of the Dalhousie Alumnae Association kept between 1916 and 1932. 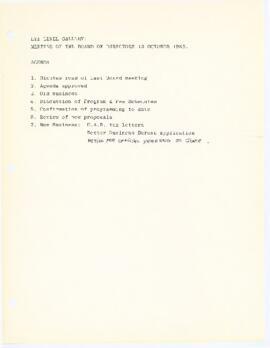 File contain meeting minutes of the Executive Committee of the Dalhousie Alumnae Association kept between 1918 and 1937. 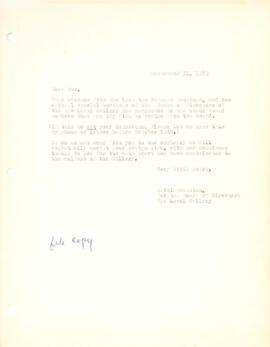 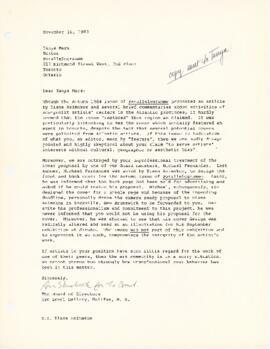 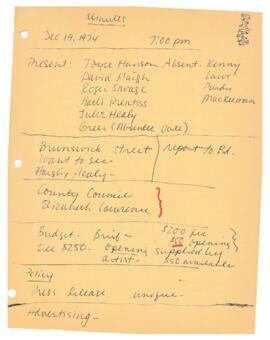 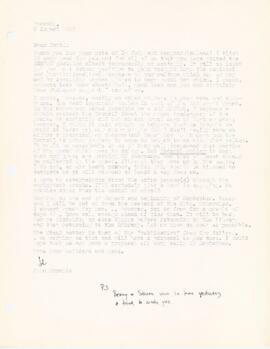 Item is handwritten minutes from the Eye Level Gallery membership meeting on July 24, 1975. 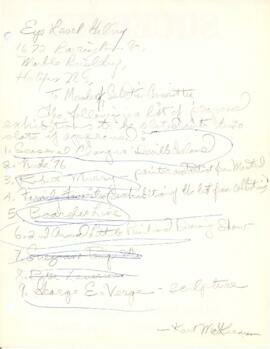 Various issues such as funding, board members, newsletters and grants were discussed. 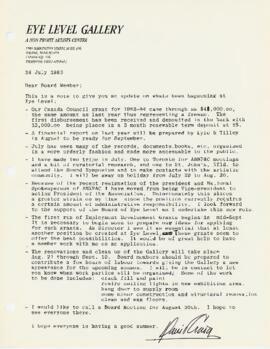 Item consists of a memo, minutes, financial statements and financial forecasts of the Eye Level Gallery. 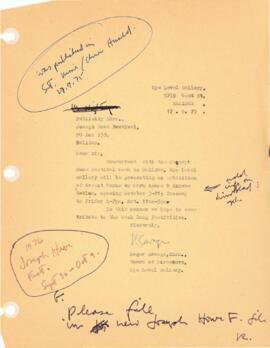 The Board of Directors meeting aimed to plan for their finances for the fiscal year. 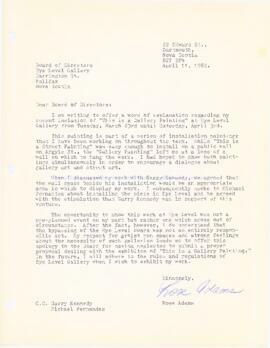 Item consists of a notice stating that Eye Level Gallery moved to the Green Lantern Building located on Barrington Street. 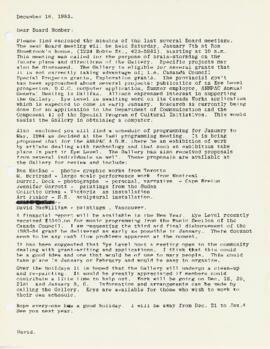 This new space offered 50% more space than their last location, which aimed to provide more programming and members. 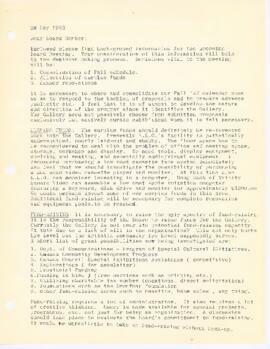 Item is a memorandum that outlines to price of heating oil for the Eye Level Gallery space that has been leased until May of 1985. 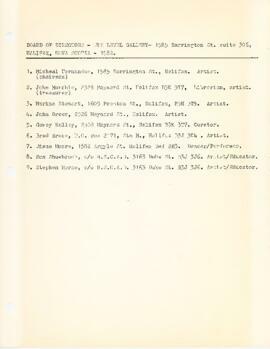 File consists of records for the 1994-1995 concert season of the Halifax Camerata Singers, including correspondence, reports, and minutes from Board meetings. 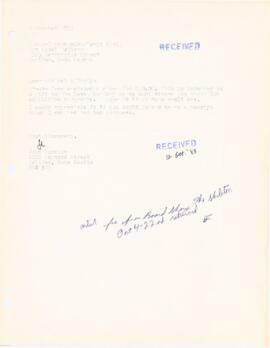 File consists of records for the 1991-1992 concert season of the Halifax Camerata Singers, including correspondence, reports, and minutes of meetings of the Board of Directors. 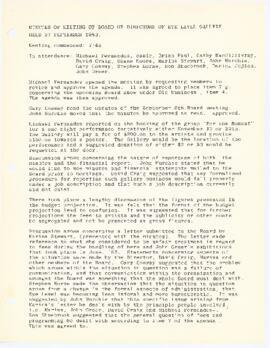 File consists of the minutes from a board meeting relating to the 1990-1991 concert season of the Halifax Camerata Singers.